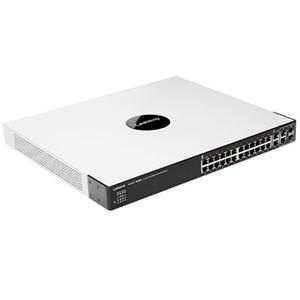 Cisco SG 102-24 Ethernet Switch - 24 Port - 2 Slot 24 - 10/100/1000Base-T - 2 x SFP (mini-GBIC) The Cisco SG 102-24 24-Port Gigabit Switch, a Cisco Small Business Unmanaged Switch, will boost your network performance and support all of your essential business applications. This switch works right out of the box and does not require any management or configuration. 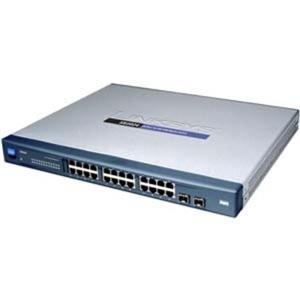 Use this switch to connect up to 24 computers, printers, network storage devices, and IP cameras. An energy-saving design reduces power consumption and costs by allowing the switch to enter sleep mode, turn off unused ports, and adjust power as needed. The compact size makes the switch ideal for areas with limited space, such as conference rooms. Quality of service (QoS) enhances network performance and improves the quality of voice and video. The switch includes two combo mini Gigabit Interface Converter (GBIC) ports that can connect your servers or backbone at Gigabit speeds. The Cisco SG 100-24 delivers powerful performance and is protected by a limited lifetime warranty. SFE2000P is optimized for maximizing the system availability with fully redundant Stacking, Redundant Power options, and Dual Images for resilient firmware upgrades. The SFE2000P is able to secure the network through IEEE 802.1Q VLANs, IEEE 802.1X port authentication, Access Control Lists (ACL), DOS Prevention, and MAC-based filtering. The enhanced QoS and traffic management features ensure clear and reliable voice and video communications. Connect up to 24 network devices, PCs, printers, access points, and servers, to share and transfer files and videos across your network.